For more than 15 years LEA has been on the leading edge in preventing the spread of invasive aquatic plants as well as controlling active infestations. In our service area we are lucky to only have a couple of active infestations of variable leaf milfoil (VLM). 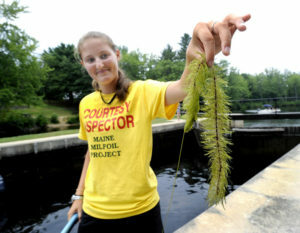 While there are 5 other invasive aquatic plants in Maine, VLM is the most widespread. Check out this map showing the locations of infested waterbodies in Maine. To learn more about the other invasive aquatic plants threatening Maine, visit the Maine DEP’s invasive species page here. Despite the relatively few lakes and ponds with infestations in Maine, LEA, the Department of Environmental Protection and dozens of smaller lake associations around the state are working hard to clean out the plants and prevent the spread to other places. Maine has an extensive network of Courtesy Boat Inspectors who help boaters keep their boats clean as they travel from lake to lake. In addition to the CBI program several organizations, including LEA, employ plant control teams in the summer to clean up infested lakes and rivers. 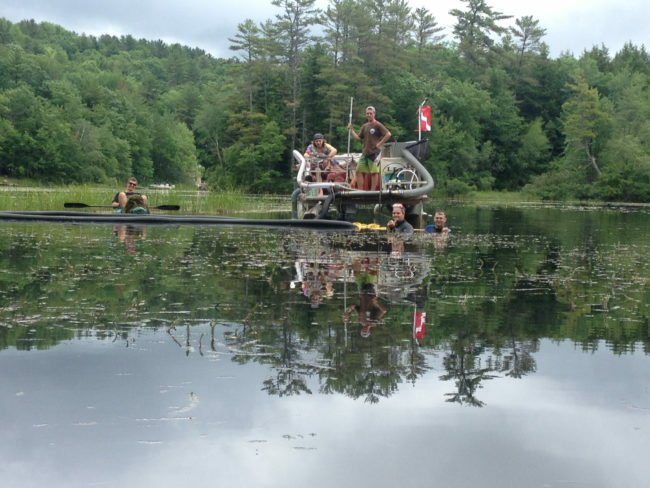 Using different methods workers are able to pull up milfoil plants and prevent new growth.